I took a little break in Palm Springs recently which was absolutely delightful. 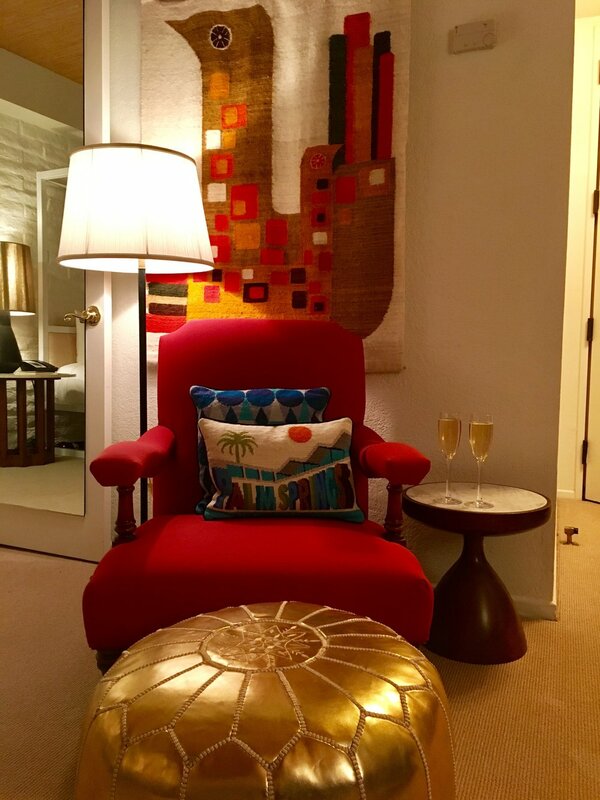 Next time you go try The Parker Palm Springs -- which is a fun, quirky hotel designed by Jonathan Adler. A highlight of the trip was dinner at Workshop Kitchen -- as if I didn't love Palm Springs enough already, Workshop is definitely reason alone for the trip. It competes with my other PS fave, SO.PA at L'Horizon. Both spots are gorgeous and the food is delic' - either would make a perfect Valentine's day date (with anyone you love!). For your next night out try a mini skirt! This navy blue lace mini from Endless Rose is clearly too short for work but great for dinner out. I love that the lace is navy and not black, and the leather detail at the waist is edgy but cute. This exact one is sold out, but a similar - and on sale -- look is here. I'm excited to wear this skirt in the summer with a simple white t-shirt and metallic sandals but for night/winter pair a mini with black tights. In general I'm loving tights with these cute Cole Haan Lana Shootie II right now (this is an insane deal on these booties!). I like texture with shine -- so pairing the leather and lace skirt with a silk blouse was an easy choice. This gorgeous navy number is from Karen Zambos RAE -- I'll let you all know if it comes back around. The pretty jewels are from my latest Rocksbox - check them out here. Grab a metallic clutch, like this one from Rebecca Minkoff (gold still available) and you're set for a night out.